Whyyyy don’t we have smell-a-vision yet? 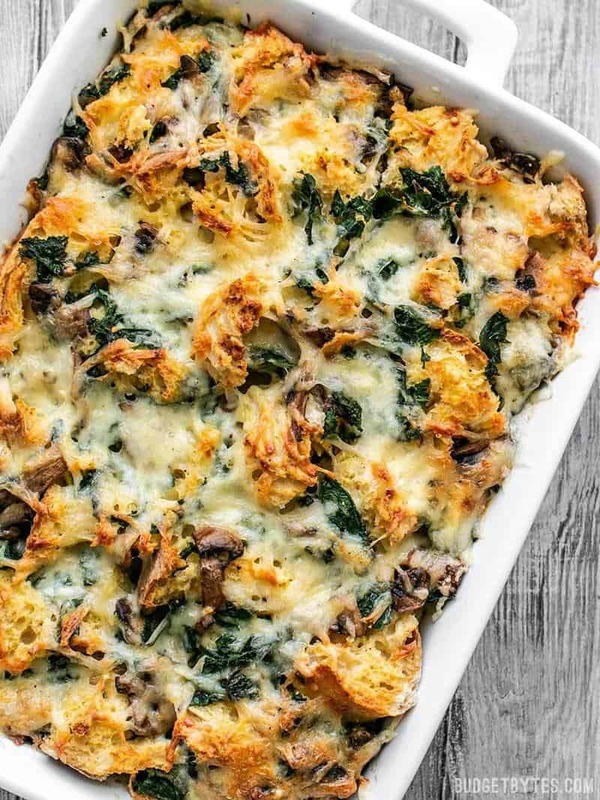 I feel like if you could smell this Kale Swiss and Mushroom Strata as it baked, it would be a total game changer. Forget photos, just smell it. 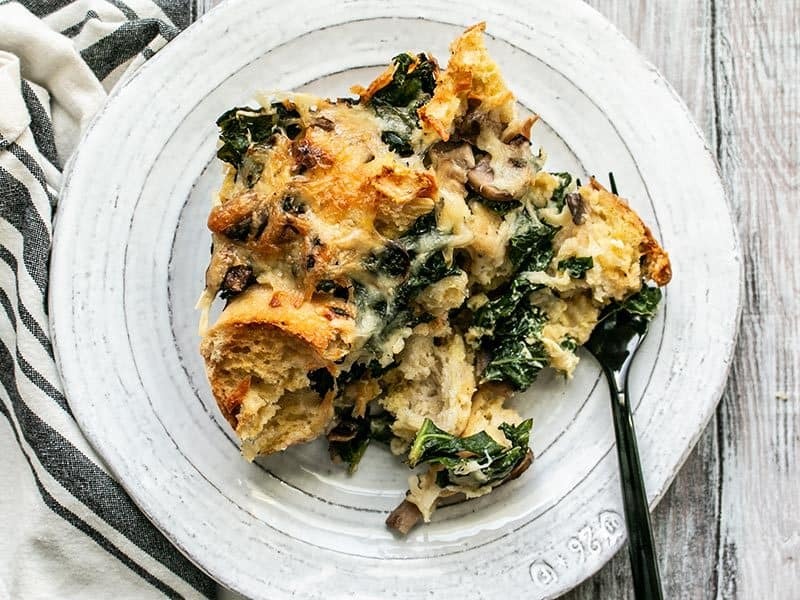 I’ve been eating this Kale Swiss and Mushroom Strata non-stop for the past three days and I’m not even sorry about it. Technically it’s a breakfast dish, but it’s definitely an all-day-every-day dish in my book. And I’m not going to lie. I 100% made this because The Family Stone is one of my favorite Christmas movies and I needed a mushrooms strata to be part of my Christmas tradition. Love eggs as much as I do?? Check out our entire Egg recipe category! I wandered around Aldi for a good 20 minutes trying to decide which cheese I wanted to use in my strata. In the end, I decided to go with the least expensive (Swiss) to make sure it was still delicious at its most basic. BUT, if you want to get a little fancy, here are a few other cheeses that you can add in addition to or use to replace some of the swiss: brie, chevre, gruyere, or Parmesan (do Parm in addition to Swiss, not on its own). And if you’re just not into kale, it’s fine to sub spinach. 🙂 Want to add meat? Brown some Italian sausage and add it in with your layers. 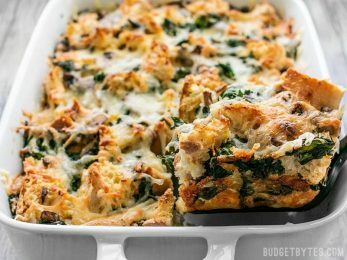 This Kale Swiss and Mushroom Strata is a filling and savory dish perfect for breakfast, brunch, or brinner! Prep the night before and bake in the morning! The day before, prepare the strata so it can refrigerate over night. Preheat the oven to 300ºF. 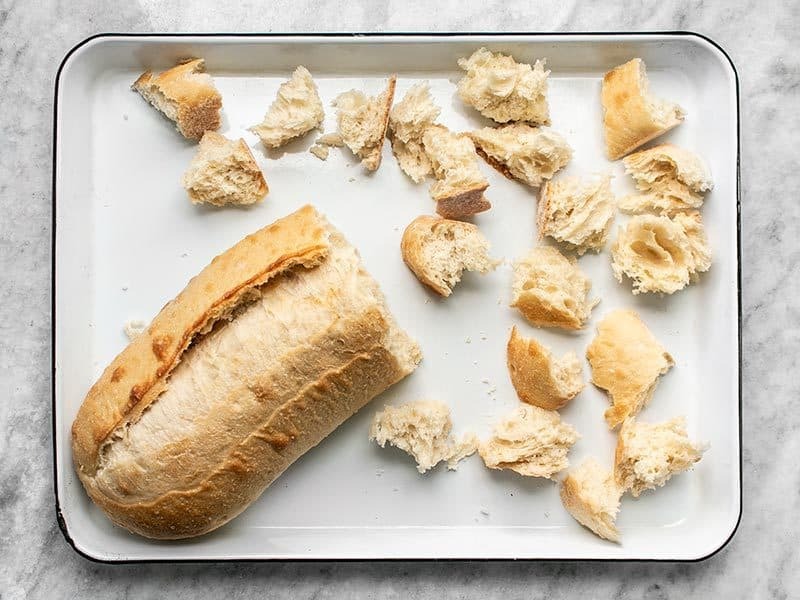 Tear the bread into 1/2 to 1-inch chunks and spread them out over a large baking sheet. Bake the bread chunks in the oven for 20 minutes, stirring once half-way through, to partially dry the bread. Meanwhile, slice the mushrooms, then add them to a large skillet with the butter, minced garlic, and a pinch of salt and pepper. Sauté the mushrooms over medium heat until they release all their moisture and begin to brown (about 5-7 minutes). Remove the cooked mushrooms from the skillet and add the kale in its place along with a couple tablespoons of water (this helps the kale wilt). 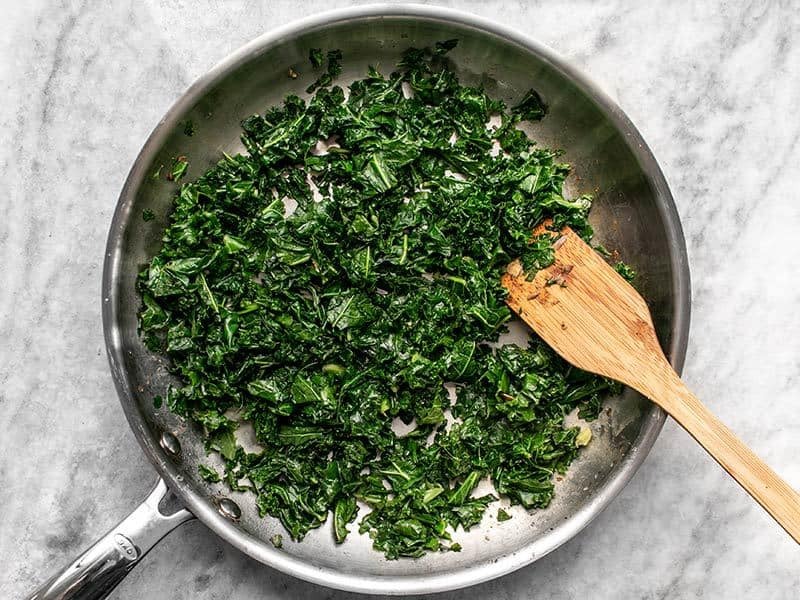 Sauté the kale until wilted (2-3 minutes). Coat the inside of a 3 quart casserole dish with butter or non-stick spray. 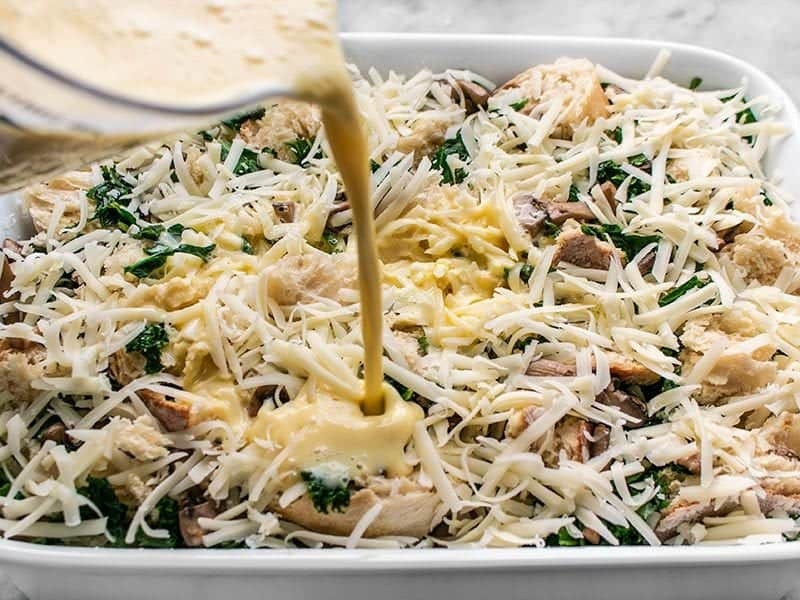 Layer half of the dry bread chunks in the bottom of the dish, then top with half of the mushrooms, half of the kale, and half of the Swiss. Wiggle the ingredients down between the bread chunks a bit, then repeat all the layers a second time. 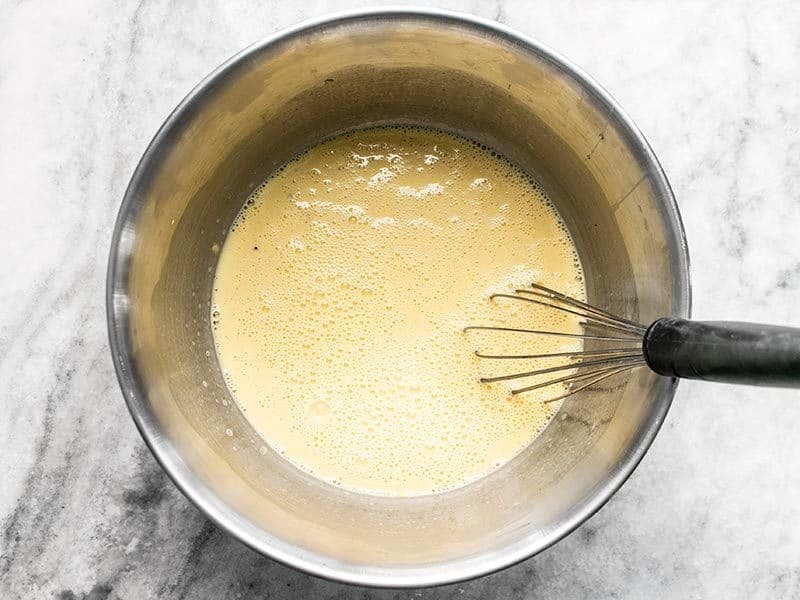 In a large bowl, whisk together the eggs, milk, Dijon, nutmeg, and 1/4 tsp salt. Pour the egg mixture over the prepared strata, making sure to drizzle over every surface of the strata, rather than just pouring in one spot. Cover the strata and refrigerate for 8-24 hours. The next day, allow the strata to sit at room temperature for 30 minutes. Preheat the oven to 350ºF. Bake the casserole for 50 minutes, or until the internal temperature reaches 160ºF and the top is deeply golden brown. Let the strata rest for 10 minutes, then slice into six pieces and serve! *I don’t suggest using soft, fluffy bread for this recipe. Use a strong bread that can stand up to soaking in liquid overnight. Any artisan loaf will work, and if you can get sourdough, that will add even more flavor! 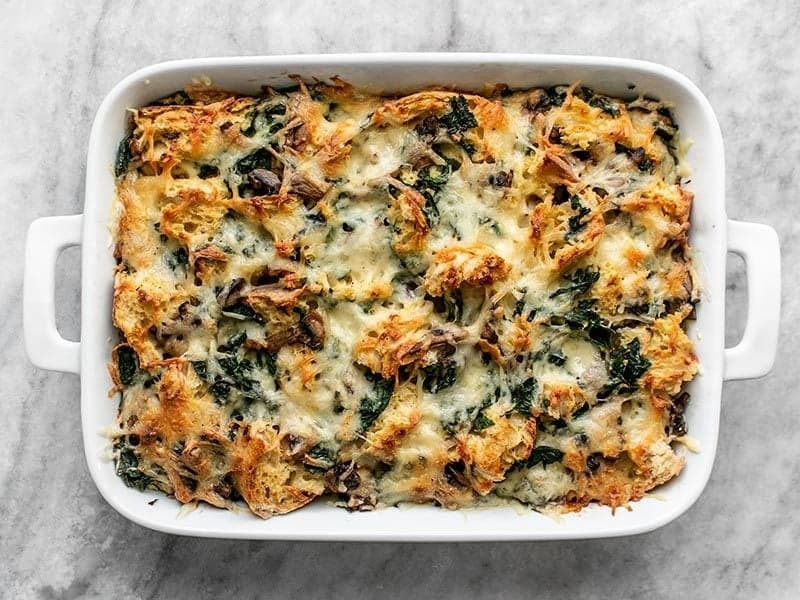 Begin making the Kale Swiss and Mushroom Strata the day before because it needs 8-24 hours of refrigeration. Preheat the oven to 300ºF. Tear one hearty loaf of bread into 1/2 to 1-inch chunks. Spread them out on a large baking sheet and bake for 20 minutes, stirring once half-way through. This will partially dry the bread, allowing it to soak up more of the savory custard. 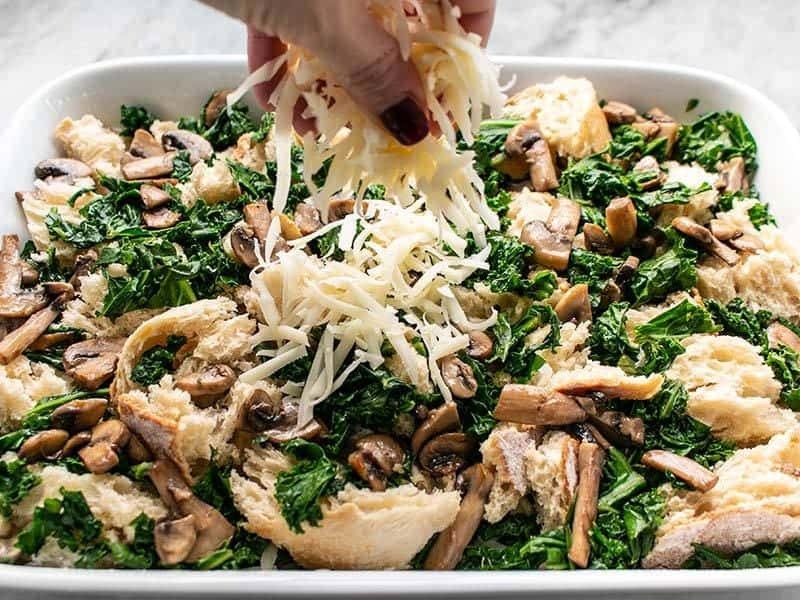 While the bread is drying in the oven, prepare the mushrooms and kale. Slice 8 oz. 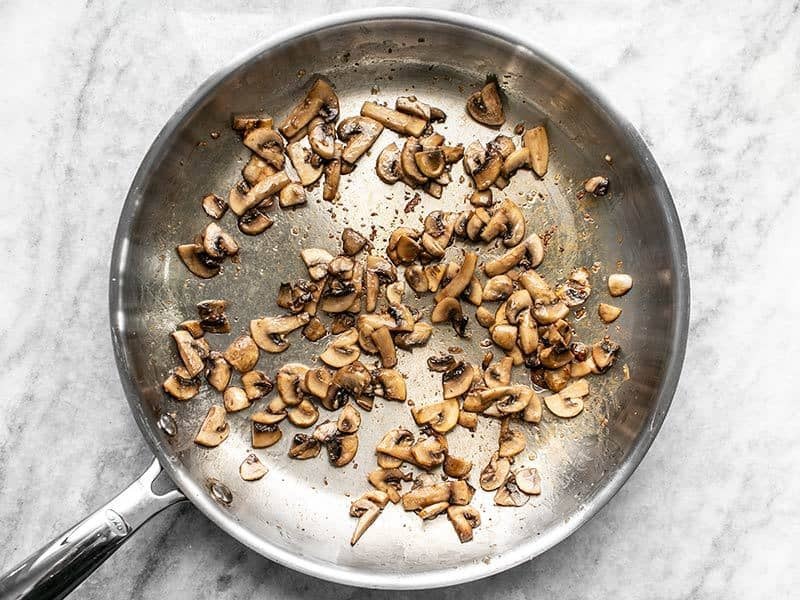 mushrooms and add them to a large skillet with 2 Tbsp butter, 2 cloves of garlic, and a pinch of salt and pepper. Sauté over medium heat until the mushrooms release all of their moisture and then begin to brown. Remove the mushrooms from the skillet, then add 8 oz. of chopped kale (about 6-8 cups, it will FILL the skillet) and a couple tablespoons of water to help steam the kale. Continue to sauté until the kale has wilted. Coat the inside of a 3 quart casserole dish with butter or non-stick spray. 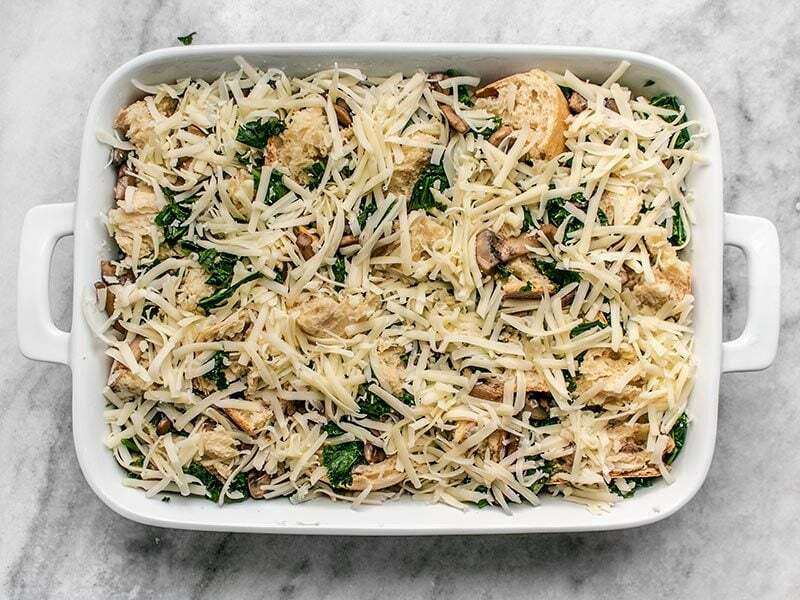 Layer half of the dry bread chunks in the bottom of the dish, followed by half of the mushrooms, half of the kale, and half of the 8oz. shredded Swiss. Wiggle the toppings down between the bread chunks a bit, then repeat another layer of each. In a large bowl, whisk together 6 large eggs, 1.5 cups whole milk, 1 Tbsp Dijon, 1/8 tsp ground nutmeg, and 1/4 tsp salt. Pour the egg mixture over the strata, making sure to pour over ever surface, rather than just pouring in one spot. Cover the dish with plastic wrap and refrigerate for 8-14 hours. 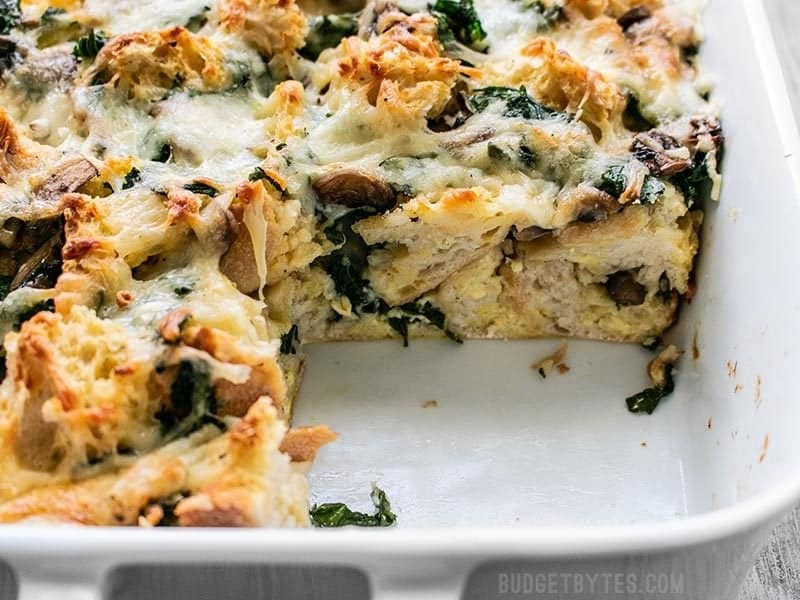 The next day, take the strata out of the refrigerator and let it sit at room temperature for 30 minutes. Preheat the oven to 350ºF. Finally, bake the strata for 50 minutes, or until the internal temperature reaches 160ºF and the top is deeply golden brown. 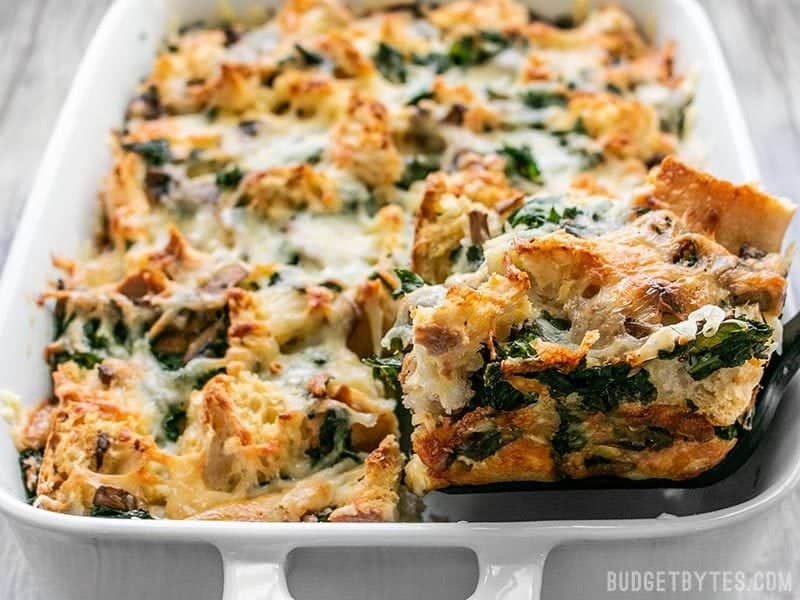 Let the Kale Swiss and Mushroom Strata rest for 10 minutes, then slice into six large pieces and serve! There it is. Not the prettiest food, but OMG if you could smell it! !